Etterbeek (French: [ɛtəʁbek]; Dutch: [ˈɛtərˌbeːk] ( listen)) is one of the nineteen municipalities located in the Brussels-Capital Region of Belgium. It neighbours the municipalities of the City of Brussels, Ixelles, Auderghem, Woluwe-Saint-Pierre, Woluwe-Saint-Lambert and Schaerbeek. In common with all the Brussels municipalities, it is legally bilingual (French–Dutch). The main university campus of Vrije Universiteit Brussel is called Campus Etterbeek, although it is geographically not within Etterbeek but in the adjacent municipality of Ixelles. 5 Proposed redevelopment "Les Jardins de la Chasse"
According to legend, Gertrude, daughter of Pippin of Landen, founded a chapel here in the 8th century. A document by Otto I, dated 966, mentions the church of Iatrebache. The name Ietrebecca – possibly from the Celtic root ett meaning "rapid movement" and the Dutch word beek meaning "stream" – is found for the first time in a document dated 1127. The current spelling appears eleven years later in 1138, around which time a newer and larger church was built. 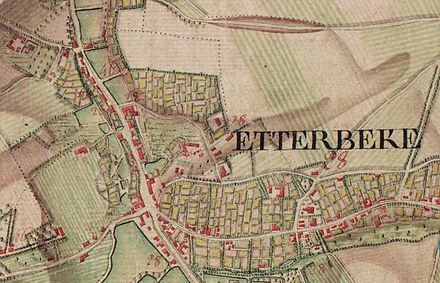 In the Middle Ages, Etterbeek was a rural hamlet mostly independent of Brussels, aside from taxation rights on beer given to Brussels around 1300 by John II, Duke of Brabant. 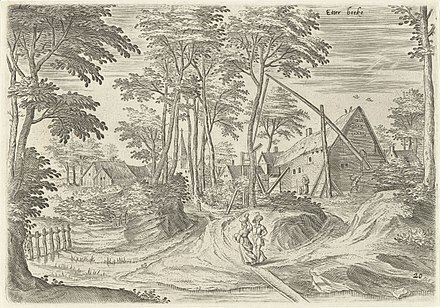 The following two centuries counted several grievous moments: in 1489, Albert, Duke of Saxe ravaged Etterbeek in his pursuit of the rebels who fought against Maximilian of Austria; in 1580, the village is destroyed once more, this time by the iconoclasts during the Protestant Reformation wars. Peace came back under the reigns of Archdukes Albert and Isabella. In 1673, Etterbeek gained its independence from neighbouring Sint-Genesius-Rode, when Charles II of Spain promoted it into a barony. The first baron was Don Diego-Henriquez de Castro, general treasurer of the Netherlands armies. The Castro house was sold in 1767 and can still be seen today as Etterbeek's oldest building. 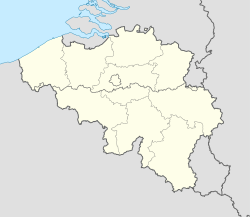 Under the French regime, Etterbeek was made into a commune, within the canton of Sint-Stevens-Woluwe. From then on, and especially after the Belgian Revolution of 1830 and the development of Brussels as a capital city, the population of Etterbeek grew quickly. In 1876, there were more than 10,000 inhabitants, in 1900 more than 20,000, and in 1910 more than 33,000. In the 1900s (decade), under the reign of Leopold II, construction boomed and changed the town's character with the addition of the broad avenues and residential areas that we know today. Two Roman Catholic churches are located in Etterbeek: Saint-Antoine / Sint-Antonius and Notre-Dame-du-Sacré-Coeur / Onze-Lieve-Vrouw van het Heilig Hart). A third church – Sainte-Gertrude / Sint-Gertrude – was demolished in 1993 as it was in danger of collapsing. The Fondation René Carcan, a foundation and museum in René Carcan's old studio, was located in Etterbeek. The Cauchie house was built in 1905 by the Art Nouveau architect, painter, and designer Paul Cauchie. Its façade is remarkable for its allegorical sgraffiti. Of a completely different character, the Barony dates from 1680 and is the oldest building in the municipality. The Avenue de la Chasse / Jachtlaan has since 27 September 2014 featured a series of large scale Le Chat drawings by the Belgian cartoonist Philippe Geluck, who was born and raised in this neighbourhood. The 24 drawings extend over a total length of 120 metres. Etterbeek has a few green areas, including the Jean-Felix Hap garden. The better known Cinquantenaire park lies on the territory of both the City of Brussels and Etterbeek. Leopold Park borders the municipality's territory. A typical Etterbeek street – "Rue des Boers/Boerenstraat"
There is a rail station called Gare d'Etterbeek or Etterbeek-Station but, like the neighbouring campus of the Vrije Universiteit Brussel, it is also located in Ixelles or Elsene. Presently, Etterbeek has one rail station (Mérode) and three metro stations (Mérode, Thieffry and Pétillon). Etterbeek hosts two football clubs (R.R.C. Etterbeek and Armenia) playing in Belgian Provincial leagues at the Guy Thys stadium, named after the famous Belgian manager in summer 2003. He led Belgium national football team to fourth place at the 1986 FIFA World Cup. In the summer of 1996, the municipal swimming pool burnt down. It has now been rebuilt and is again open to the public. Proposed redevelopment "Les Jardins de la Chasse"
A project is currently proposed to redevelop an area of Etterbeek near the Avenue des Casernes. This project would result in the town hall and police station being relocated to new buildings in a central administrative centre on this site. The new site is being called the Jardins de la Chasse (French) or Tuinen van de Jacht (Dutch). Demolition of the former CPAS building on the site started in 2014, and building of houses on the site started in 2016, with construction of the new town hall awaiting administrative approval. Municipal offices are forecast to move to the new location in summer 2018. The site of the current town hall may in the future be used for further residential development. Etterbeek hosts an annual medieval market. Previously held at the end of May on the Avenue du 2ème Régiment de Lanciers in the south of the municipality, in recent years it has taken place in Cinquantenaire. ^ "Journal La Vie Etterbeekoise Octobre 2014" (pdf) (in French). ^ "Les Jardins de la Chasse" (pdf) (in French). Retrieved 12 October 2008. ^ a b Julien Thomas (22 September 2014). "Les Jardins de la Chasse verront le jour d'ici 2019" (in French). dh.be. Retrieved 23 January 2017. ^ Patrice Leprince (1 February 2016). "Etterbeek: les Jardins de la Chasse se profilent" (in French). Le Soir. Retrieved 23 January 2017. Wikimedia Commons has media related to Etterbeek.